The article has created a little ripple of a buzz inspiring some others to do a little writing of their own. Here is a nice write up by John Kowalski's Babacita blog shout! Thanks for the good words John! 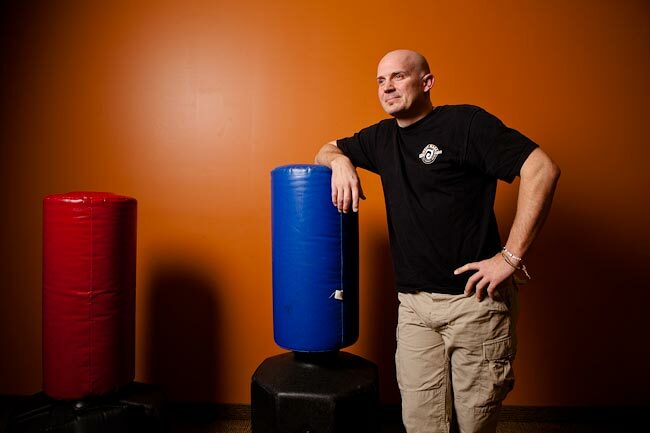 An excellent article on Krav Maga and local Grand Rapids, MI instructor Craig Gray. I’ve had the honor and privilege of knowing Craig as a friend and also training with him for a few years. He is the utmost professional and extremely skilled in teaching this important, life-changing mentality and skill set. This offers more than just physical protection; it prevents psychological fallout. According to Gray, except for the four percent of people who are sociopaths, all humans must justify their actions. Violence requires us to “separate” and dehumanize — an immediately effective, yet ultimately volatile workaround that can eventually lead to post traumatic stress. A chill ran up my spine when I first heard the news regarding the terrorist bombing a bus in Israel, especially upon the news report of the particular bus that was said to have been hit: Bus #174 to Maaleh Adumim. It is the bus I take when I am training in Israel with Israeli Krav International Head Instructor, Moshe Katz. My first thought was, is Moshe alright?! Once I found out that he was, my next thought was, "Hey, that is the bus that I take. It could have been me on that bus!" Reality check and some food for thought! Another Krav Lesson. Later reports confirmed that it was NOT bus #174, rather it was bus #74, regardless a tragic event all the same. Here is an article Moshe wrote regarding the recent terrorist bombing in Israel. 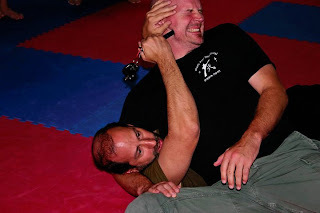 Moshe (bottom) & I showing some Krav Maga ground tactics at a seminar in Indy (ouch!). Here is a blog post by Moshe Katz. I liked what he says here and thought you would find it insightful as well. We all wear many masks throughout our lives. We are trained not to act spontaneously, not to show our hand, not to reveal too much. A child cries when it feels like it, even if the timing and location are very poor. Tomorrow I will fly to the USA, a twelve hour flight, and I pray I will not be near any crying children on the plane. As a child grows older his parents train him how to behave in public, and this is a good thing. We must learn to be considerate of others, not to shout out loud in public when we are overly excited about something. We live in a civilized society and we must be constantly aware of our behavior and be considerate of others. But then there are moments when a person might lose control. He might forget all his careful etiquette and proper behavior and his gut feelings will come out in an explosive way. At this point we hope that his inner nature is a good one and that he does not do something dangerous or tragic. Krav Maga builds on this gut reaction. Many martial arts are built on complex techniques that take years of training and condition to absorb. When a real life situation requires action, and our stress levels go through the ceiling, we tend to lose all those finely honed skills and revert back to instinct. The mask falls off and we are back to basic instinct. Krav Maga is built on those instincts. Krav Maga trains us to use our natural instincts in the best way possible. We don’t' fight our instincts. We don't train ourselves to go against our natural inclinations, we flow with them. That is why a technique may come out different depending upon the circumstances. Based on the size of the attacker, or his body motions, the Krav technique might take different twists and turns. 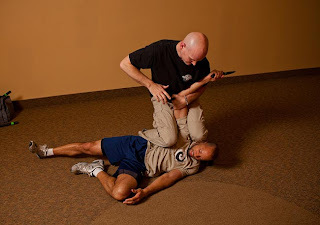 The point is that as long as the Krav principles and basic techniques are adhered to – the situation will turn out well. We learn a technique, we understand the underlying concept and then we train with speed, power and resistance. It may not come out picture perfect every time, it may not look the same every time; that is of no consequence. We value aggressiveness over finesse; we use our mindset and attitude to counterbalance and overcome obstacles. In Israel we have a saying, "We overcame Pharoh; we shall overcome this". No situation is viewed as hopeless. The Israel Defense Forces, Krav Maga and in fact all of Israeli society are built on the idea of rising to the challenge, thinking on your feet and working with your gut feeling.